Department store Debenhams has once again listed on the London Stock exchange, with shares climbing by 2%. The move comes two and a half years after the department store was taken over by venture capitalists. Shares were listed initially at 195 pence each, close to the lower end of the range forecast, but rose rose to 202.25p by the end of trading. The 195p figure valued the firm at £1.675bn ($3.08bn), roughly its value when it was bought three years ago. The high street store's owners - CVC Capital Partners, Texas Pacific and Merrill Lynch Global Private Equity, in addition to the firm's management - have sold 487 million shares. But this still means they will hold onto 43% of the shares. The department store chain, which has 123 outlets, was bought in 2003 for £1.7bn plus £100m in debt. Since being under private ownership, the firm's market share has grown from 15.2% to 18.6%. But at the same time costs have been squeezed and jobs have been cut. Recent developments include spending about £260m to revamp stores as well as open new ones. 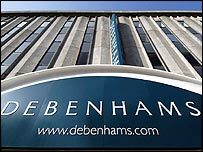 Debenhams has also reduced the number of its suppliers from 700 to 500. Do we still like being served?